Synagogue at Ro'i was dedicated to the memory of the three murdered youths Eyal Yifrach, Gilad Sha'ar, and Naftali Frenkel. The secular town of Ro'i in the Jordan Valley has chosen a unique way to mark its 37th birthday: by building its first synagogue. 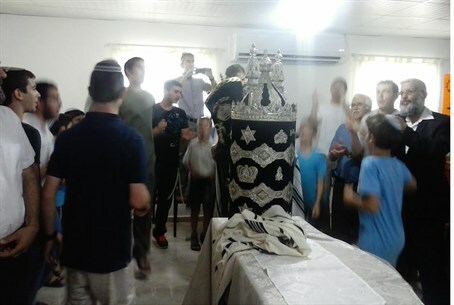 With the help of the Ayelet HaShachar organization, the synagogue was up and running this past Friday, just in time for the first Sabbath of its 38th year. It was dedicated to the memory of the three murdered youths Eyal Yifrach, Gilad Sha'ar, and Naftali Frenkel. The Ayelet HaShachar outreach body specializes in building first-synagogues in towns throughout Israel, and has done so many times over the past decade. Two hundred people took part in the special dedication ceremony in Ro'i, including Israel's Deputy Minister for Religious Affairs Rabbi Eli Ben-Dahan, Knesset Member Moshe Feiglin, World Mizrachi President Kurt Rothschild, Beit Yaakov Safra congregation Rabbi Ephraim Laniado of Sao Paulo, and Jordan Valley Chief Rabbi Menachem Glitzenshtein and Chief Executive David Alchayani. Just two days before the ceremony, Ayelet HaShachar Director and Founder Rabbi Shlomo Raanan proposed to the Ro'i Town Council to dedicate the new synagogue to the memory of Eyal, Gilad and Naftali, victims of cruel Palestinian Arab kidnappers and murderers. A municipal session quickly convened in Ro'i, and the proposal was accepted with alacrity. Representatives of the town then paid a shiva call to each of the three families and informed them that their new synagogue would memorialize their loved ones. The families themselves could not participate at the dedication, because of the shiva, but sent representatives. The Religious Affairs Ministry contributed the building for the new shul, while Ayelet HaShachar donated the Holy Ark, benches and chairs, and siddurim and chumashim. The beautifully adorned Torah scroll was contributed and dedicated by Prof. Fein and his wife of Karnei Shomron. Orit Harel, a founding member of the original outpost that later became the town of Ro'i, explained to the participants how the synagogue came to be built. Many years ago, she worked together with Ayelet HaShachar to build a synagogue in another secular town in which she lived, Timrat in the Lower Galilee. Now, she emotionally told the audience, she feels that a circle has been closed with the construction of "her" second synagogue - in a place that, for at least the past 1,900 years, had never seen one. Ayelet HaShachar, with dozens of new synagogues under its belt, has recently completed one in Kibbutz Gvar'am just south of Ashkelon, and is currently involved in new projects in Kfar Aza, Netzer Sireni near Ramle, and Beit Kama in the northern Negev. "Each and every first-synagogue is a totally new and exciting endeavor for us," according to the dynamic Rabbi Raanan. "We never tire of finding new places in which to build a new synagogue."